Also serving communities of Macedon. There are 26 Assisted Living Facilities in the Fairport area, with 3 in Fairport and 23 nearby. The average cost of assisted living in Fairport is $3,745 per month. This is higher than the national median of $3,346. To help you with your search, browse the 158 reviews below for assisted living facilities in Fairport. On average, consumers rate assisted living in Fairport 4.0 out of 5 stars. Better rated regions include Pittsford with an average rating of 4.5 out of 5 stars. Caring.com has helped 9 families in Fairport find high-quality senior care. To speak with one of our Family Advisors about assisted living options and costs in Fairport, call (855) 863-8283. Fairport is a suburb located nine miles east of Rochester in New York and is known as the Crown Jewel of the Erie Canal. Fairport has been named one of the Best Places to Live by Money Magazine, and with its abundance of culture, it is a viable option for seniors seeking assisted living communities. Within the state of New York, assisted living facilities are known as adult care facilities (ACF) and are defined as centers providing long-term, non-medical residential services to adults who are unable to live on their own. The New York State Department of Health regulates ACFs and is in charge of licensing the three separate categories of facilities including enriched housing programs. The Fairport area has no facilities from which to choose in the event of a medical emergency or illness, with the nearest major hospital located in Rochester. With an average high of around 80 degrees in July and an average low of 18 degrees in January, Fairport tends to maintain a colder climate. Additionally, Fairport typically experiences nearly triple the average U.S. snowfall, with around 74 inches of snow a year. Seniors who enjoy warm temperatures should acknowledge the colder weather in Fairport when contemplating ACFs in the area. Fairport is considered safer than 70 percent of U.S. cities with a crime rate of approximately 9.5 crimes per 1,000 residents. Because of this, seniors choosing an ACF in this area can be assured incidents of violent and property crime are statistically low. Air quality is ranked based on the number of harmful air pollutants within the atmosphere. With a score of 69, Fairport's air quality falls approximately 11 points higher than the national average of 58. Seniors with lung conditions such as asthma or bronchitis should consider Fairport's air quality. The cost of living in Fairport is approximately 1 percent cheaper than the national average, and around 23 percent less expensive than the average cost of living for the state of New York. Fairport could be suggested to seniors looking to live in New York with a lower average cost of living. Throughout Fairport and the neighboring regions, the Regional Transit Service is used for public transit. Seniors pay half-fare during non-peak times. Assisted Living costs in Fairport start around $3,745 per month on average, while the nationwide average cost of assisted living is $4,000 per month, according to the latest figures from Genworth’s Cost of Care Survey. It’s important to note that assisted living rates in Fairport and the surrounding suburbs can vary widely based on factors such as location, the level of care needed, apartment size and the types of amenities offered at each community. 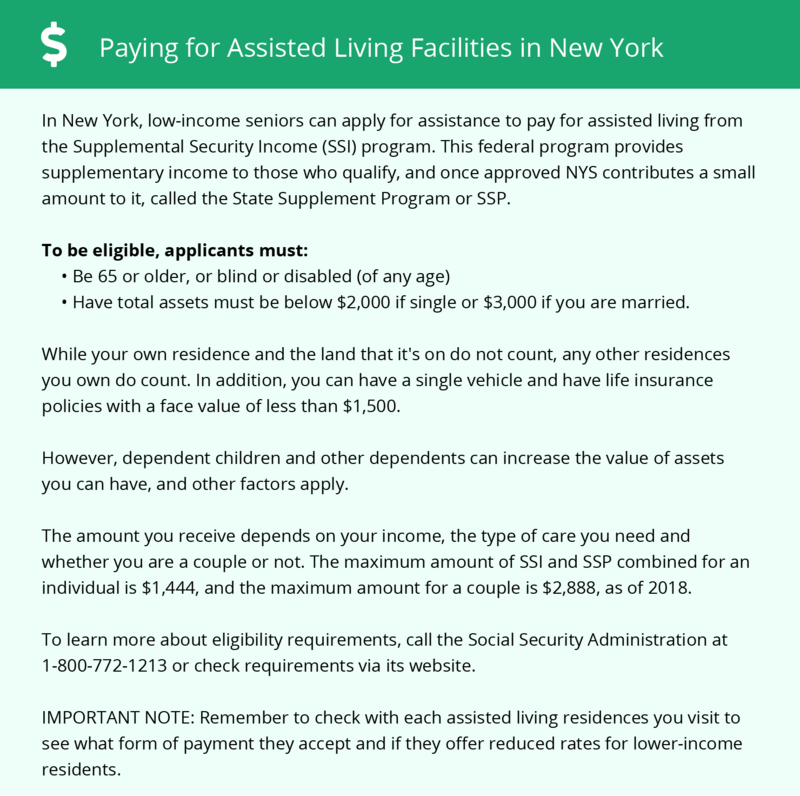 Eligible seniors soliciting financial assistance in New York should consider the Medicaid program's Assisted Living Program (ALP) waiver. Available to private-paying and Medicaid recipients, this opportunity is restricted to 4,200 applicants. Fairport and the surrounding area are home to numerous government agencies and non-profit organizations offering help for seniors searching for or currently residing in an assisted living community. These organizations can also provide assistance in a number of other eldercare services such as geriatric care management, elder law advice, estate planning, finding home care and health and wellness programs. To see a list of free assisted living resources in Fairport, please visit our Assisted Living in New York page. Fairport-area assisted living communities must adhere to the comprehensive set of state laws and regulations that all assisted living communities in New York are required to follow. Visit our Assisted Living in New York page for more information about these laws.